But every so often, if one of us had a friend or two over to play and we found ourselves in a lull, she would take pity on us and come up with these amazingly creative ideas, from fun little games to large scale projects of awesomeness. One of my favorites was a game she resurrected from her own childhood in Even Smallertown, Illinois called an arrow hunt. The idea was that one person (or one team) would take a piece of chalk and go somewhere in our Smalltown neighborhood to hide. 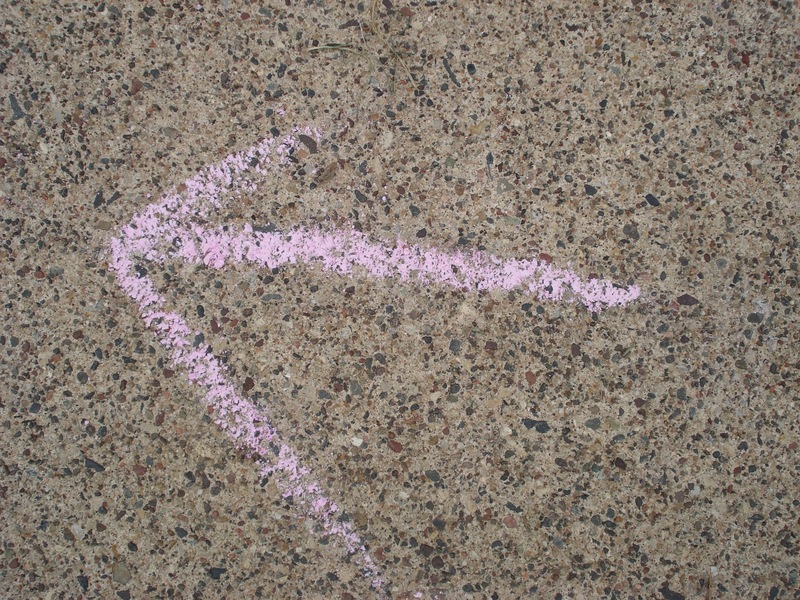 Along the route, the hiders marked a chalk arrow every time they changed directions. The arrow had to be clearly visible, though it could be in an unexpected place, and the final arrow pointed to the spot where the hider(s) would be found. The game was a hit. It killed a lot of otherwise boring summertime hours, no toilets were scrubbed, and my friends and I discovered all the nooks and crannies of the nearby park and neighborhood landscaping. And I got really good at spotting a trail. 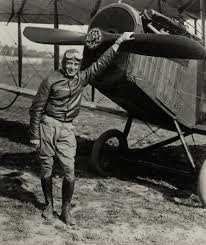 So did pilot Jack Knight on one dark night in 1921 when he completed a successful flight from Chicago to North Platte, Nebraska. This was important for two reasons. First, it was the first (and possibly only) time anyone ended up in North Platte on purpose. Second, Knight’s flight had been a test for the US Postal Service. A relatively new technology, airplanes offered the promise of efficient coast to coast mail delivery. But navigation was still in its infancy with pilots relying on landmarks to guide them. This meant that night flying was pretty much out. It’s possible this man has no idea where he’s going. That is until someone had the brilliant idea to use postal workers and citizen volunteers to man a series of bonfires along Jack Knight’s dark route. His success led to the (slightly) more sophisticated plan to dot the Transcontinental Air Mail Route from New York to San Francisco with 50-foot steel, gas-lit beacons mounted into giant yellow concrete arrows on the ground. Each arrow pointed toward the next beacon, around ten miles or so away depending on topography. 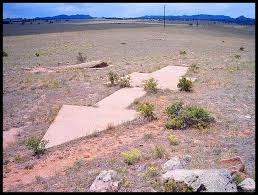 Congress thought it was a great idea and by 1924 there were giant arrows pointing the way from Cleveland, Ohio all the way to Rock Springs, Wyoming. 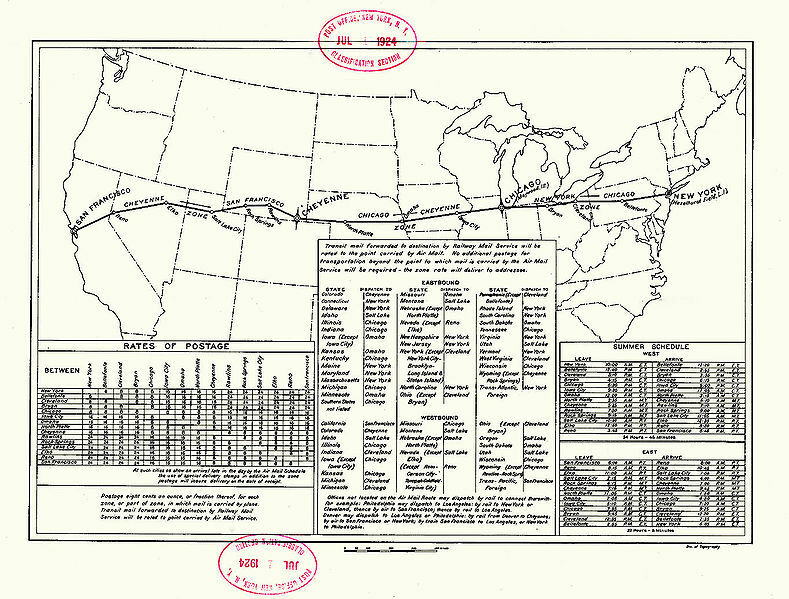 And because the Postal Service realized there weren’t a lot of reasons to stop in Rock Springs, Wyoming, the route was extended over the next few years, eventually reaching from New York to San Francisco. Of course it wasn’t long before fancier navigation systems developed and pilots began to feel that radio frequencies were somewhat more reliable than the old fly-real-low-and-follow-the-arrows system. During WWII, the steel beacon towers were dismantled and repurposed, putting a practical end to the dotted Transcontinental Air Mail Route. But the arrows are still there. Their paint is faded and they may have a few cracks here and there, but many of them that haven’t become the victims of development are still there to be found by the odd eagle-eyed traveler. So we’re almost to the countdown to the start of school. I am not as creative as my mother and my boys are spending their childhood in Not-So-Small-Suburb, Missouri so even in our very safe neighborhood, I’m not terribly comfortable with the idea of them chasing arrows through the streets. My solution for summer boredom is to plan the big family vacation for the end of the summer, as a reward of sorts, for making it this far. And now I know as we pack up for our trip west, we’ll be following the arrows after all. Arrows go left. Arrows go right. Follow in the morning, or follow them at night. Sarah that is so interesting! Never knew this but have always been intrigued by the aviation of that era! My grandmother was one of the first people in her town in rural Georgia to fly. There would be people that would fly from town to town selling flights out of country pastures. Cool! I don’t know a lot about early aviation, but stumbled on the arrows while researching for our family vacation. Those early pilots were real daredevils. A fascinating book by Gen. Jimmie Doolittle, “I Could Never Be So Lucky Again,” recounts his barnstorming days. Air races galore. He and others of his era had to overcome disdain and outright opposition from the establishment to show the worth of air power–for both military and civilian applications. But like Gong, I never knew about the system of arrows. Your mama was indeed a creative lady. Great story about avaition history in America! Well written and enjoyable! How interesting! What a cool discovery. You always find the gems of history to share. Thx. Glad you all are having fun hugging giant corn and licking ice walls. Where did you find this info., great story and tie-in. So you will follow the arrow west and entertain us with stories on the way? I stumbled on this while doing some trip research. Unfortunately, though we were probably close to a few of them, we didn’t have time to hunt for the arrows. It was a great trip and will probably provide a few blog posts in the near future.